While the merger announcement and post-merger integration process where the two firms come together is filled with uncertainty, veterans of these experiences understand that there are both risks and opportunities in the situation. Before making a rash maneuver and jumping off too quickly, it pays to be patient, assess your opportunities and make an informed decision about your future with the new organization. Access to coveted customers or channels of distribution. Of course, all of this “access” is effectively a strategic bet on the ability of the two firms to come together and turn potential into reality. Regardless of the rationale for the merger on paper and in the press, producing those targeted benefits is hard work. Those managers and employees who are able to help bring the benefits to life stand to prosper. You can answer the question. “What does this mean for me?” by reviewing your firm’s historical approaches to these transactions and looking and listening for intentions from senior management. If your firm typically acquires and leaves the acquired company alone to operate on its own, not much will change for you or your team members. This portfolio approach is typically pursued by organizations categorized as conglomerates or outside investment groups interested in owning a wide variety of companies. While financial oversight and reporting requirements may change, the acquirer will expect the acquired firm’s management and employees to do what they do best, and drive growth and expected profits. Very little will change for you or your team members. Alternatively, if your firm’s history or the acquiring firm’s track record is to combine operations, it is reasonable to anticipate significant changes as a result of what is termed an integration process. You will work with your new peers to develop and execute the plans required to combine activities and eliminate redundancies and exploit opportunities. While this situation is the most invasive one, remember that the new firm is dependent upon help to bring the expected benefits to life. As uncomfortable as it might feel, actively supporting the integration process is a great way to increase your value and the value of your team members in this new and changing organization. 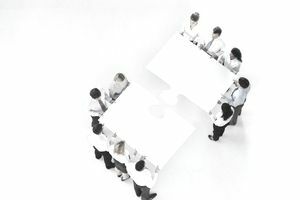 In well-managed post-merger integration activities, teams from both firms are typically assigned to bring operations together. This team environment offers an opportunity for you and your direct reports to shine. The tips below offer ideas on surviving and thriving during the post-acquisition integration process. Adjust your attitude on change. The words are easy, but to truly optimize your opportunities, you must accept that this is the beginning of a new chapter. The firm you joined and worked for will evolve into something very different, as will your job and the colleagues you work with every day. Accept that it is possible your role will be eliminated. It pays to be prepared, but do not assume you have to go out and get a new job the next day or even over the next year. In most (but not all) cases, it takes time for the new organization to sort out roles and responsibilities and identify redundant positions. And even if your job is eliminated, many firms provide advance notice and encourage employees to apply for new roles elsewhere in the organization. For some of these organizations, it is common to offer a generous severance package when the termination is a result of organizational change due to the merger. Recognize that your team will take their cues from you. If you are frightened, concerned, or if you talk negatively about the process and the career prospects, your team will take on that same persona. Prepare your attitude daily and portray a realistic and helpful perspective to your team members. Offer to help with the integration. As stated above, the success of the merger in driving cost savings and gaining internal efficiencies or gains in the market requires the active support of employees and managers. Become a problem-solver and a champion for positive change and you improve your odds of remaining part of the long-term picture. Providing opportunities for your team members to support the work of integration allows them to showcase their skills and strengthen their case for remaining as part of the new firm. Be flexible. It is highly probable that you and your team members will be asked to shed long-time responsibilities and take on new activities as part of the integration process. Treat these as opportunities to learn and grow, and coach and counsel your team members to do the same. Do not contribute to the rumor mill. Coach your employees to steer clear of this potentially toxic habit. It is always tempting to engage in wild speculation over the future, but it is incredibly counter-productive. Share regular updates with your team members and encourage them to come to you with questions and concerns. Coach your employees on how to navigate change. Just as you have concerns and misgivings about the changes, your employees will feel equally or more vulnerable. Work hard to provide context for changes and strive to involve your employees in solving problems and supporting the cause. They will look to you and your approach to the changing situation for support and confidence. Be patient and look for signs of the emerging culture. The acquirer tends to take the dominant role in the post-merger integration, and the culture of this firm will invade your organization. Watch how people in this firm conduct themselves. Do they have strong core values that resonate with you? Are they ethical? Do they seem to enjoy their work? Is this an organization you can see yourself serving and supporting? While the initial period following a merger announcement is filled with uncertainty, it takes time to assess whether this new organization is a good fit for you. Invest in yourself and your team members. While you are actively supporting the merger activities as outlined above, it pays to work on your own time to revive or strengthen your professional network, develop new skills through school or training and prepare for a potential separation. Counsel your employees to take these very reasonable and appropriate steps in their own lives. While it is possible you and your co-workers will remain in the new organization for years to come, it always pays to be prepared. Navigating a merger process as a manager and as an employee of one of the firms is a stressful situation. While our tendency as humans is to look at the potential risks and trigger our fight or flight responses, it pays to step back, study the situation and offer positive support. For those who adopt this constructive approach, the odds of the merger turning into a very positive career step improve dramatically.